There are a lot of different ways to launch programs in Linux. You can use the Applications menu. You can open up your file browser to /usr/share/applications and double click the launchers you find there. You can install a program like Synapse, which allows you to type a keyboard shortcut, then simply type the name of the program you want to use. All of these have their advantages and disadvantages, but programs like Synapse (and GNOME Do), are very fast. But if you don’t want to install an extra program just to launch other applications, the built-in Run Dialog already exists on your system. To access the Run Dialog, simply type Alt+F2 and the window appears. Now type in the name of the application you wish to run, and hit Enter. This is incredibly fast, but one problem exists that keeps it from being even quicker. Many programs have names that are very similar. To see an example of this, go to the Terminal, type “gnome-” and then hit the Tab key. 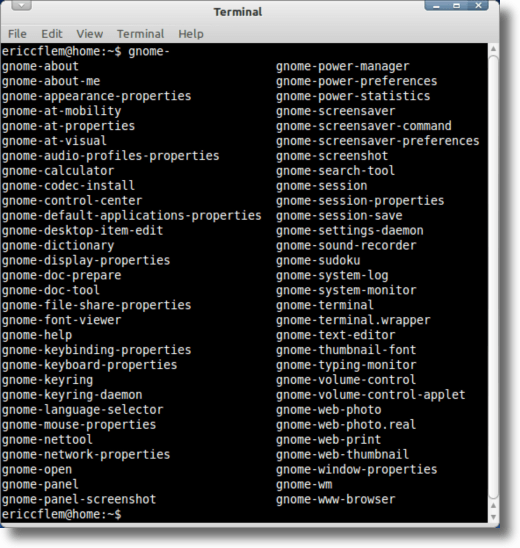 A huge list of programs will appear, each of them starting with “gnome-” which means to launch any of them you would need to type all that, plus the part of the name that is different from the rest. For instance, if you want to launch the Terminal, you would type “gnome-terminal” which isn’t intuitive. It would be nice if you could simply type “terminal” and have it launch. What this does, as the system administrator (or super user, or root), is create a symbolic link between gnome-terminal (which launches the terminal), and a new launcher, called terminal. When launched, “terminal” quickly launches “gnome-terminal,” and the Terminal loads. The same can be done for names which aren’t necessarily long, but might be less than intuitive. For instance, the default calculator isn’t simply launched by typing “calculator” into the Run Dialog or Terminal. Instead, “gcalctool” is its name. This is, as mentioned, not what you’d expect. However, since no program that uses “calculator” as its launcher is installed, we can create that link and use it with “gcalctool” to speed things up. From now on, since “firefox” exists in your binaries folder, launching it will launch the actual binary, located in your home folder. Using this method can vastly speed up the process of launching an application, but one does need to take caution in using it. If you were to create a link and then later install a program that uses the same launcher name, problems will exist, either with your original launcher or the new one. So be sure you’re not causing yourself more problems than you’re solving. But done properly, creating aliases as necessary is a great time-saving tool that should increase your efficiency at the computer.